Every good idea starts with a problem. Our client, American International College (AIC) was faced with several challenges in their journey to reinvent their campus for Generation Z. As the architect and designer, we crafted several unique solutions geared to increase enrollment and focus on student needs. The ‘Money Walk’ is when parents take their son or daughter on their first campus tour. They want to see where their child is going to eat, sleep, play and study; the main attractions - the Dining Commons, the Dorms, the Gym and the Library. AIC's had recently renovated their Dining Commons and next on their list: a study destination, the Shea Library. The Shea Library was built in the 1960s, had never been renovated, and was in poor condition. The way it was originally designed and the functionality, had nothing to do with the needs of today’s faculty and students. More importantly, it was already March and the College needed to create a splash that would excite and engage current and prospective students. The College instructed the design team to go forward and specify new, attractive furniture and paint colors to spruce up the place. It wasn’t what the college administration or students wanted, but they felt it was the only option given timing and their budget. The design team began by asking what if? What if we could do a low scope renovation, and transform a library that could meet the needs of today’s students? How could we develop a design solution that engaged AIC’s customers, and what if, in doing so, could transform a campus? Studying the habits and behaviors of out-going millennials' and in-coming centennials' (Gen-Z) and incorporating a design meant for them in retail, hospitality and even the corporate environments. They prefer an fully-customized, unique experience in how they eat, learn and play. Why couldn’t the library accommodate for those needs? We worked with the Administration to present an innovative and new approach that captured the needs of the Campus, while keeping it a low scope remodel. The Board had considered de-funding the project, but after hearing the design team's presentation, they unanimously approved the renovations, doubled the budget and moved forward with the remodel of the Shea Library. Creating ‘Magnets’ – environments where students wanted to be. Creating ‘Bridges’ – connections to the college community, the neighborhood, and the cultural and academic institutions of Greater Springfield. Creating ‘Outposts’ – an environment that was customized to both the commuter student and the residential student. Creating ‘Fields’ – opportunities for student engagement and collaboration both within the campus community and beyond. Elimination of the the resource desk, and replacing it with an iPad-carrying ‘concierge’, where the guidance and resources a student wanted was brought to them. Flexible seating that was easily modified to support the needs of an individual, a study group, or a guest lecturer. Creating a Café offering healthy drinks and snacks prepared and served on site. Creating ‘bookable-boxes’, where students could reserve technology-focused suites for intensive group learning. A focused design that promoted and supported interaction, collaboration, and engagement to the campus. Technology brought directly to every seat throughout the space. Color and materials that were both inviting and fun. The end result was a true transformation. The new Student Commons has become both the social and learning hub of the campus, providing a unique opportunity for students to connect and collaborate that never had existed before. Library usage has increased by 70% since the renovations have completed. 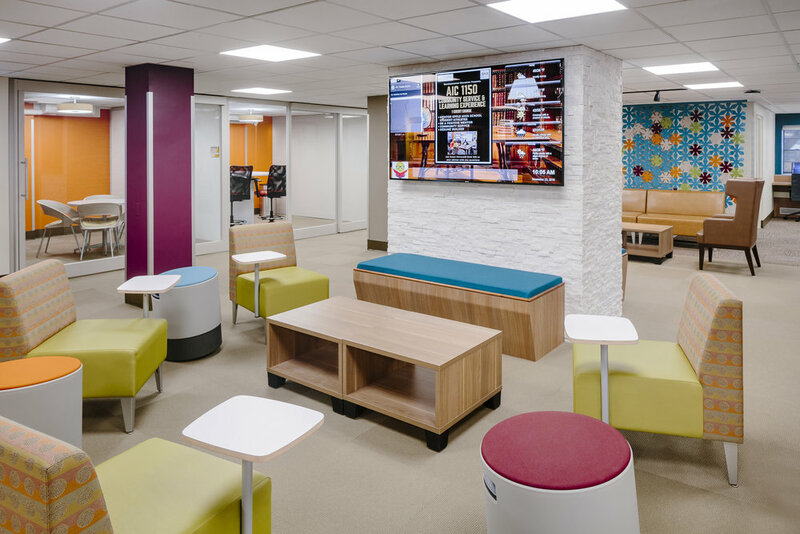 The renovation was completed on time and within the anticipated budget, representing great value to the academic community, as a low-scope, summer project.